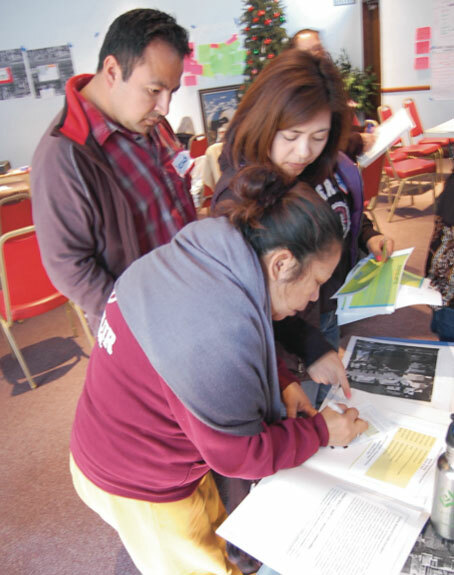 Workshop Activity: Curriculum for a workshop with residents, tenants, and local stakeholders. Preparation: Preparation activities for facilitators in between workshops. Presentation: Educational slides to inform participants during a workshop. Several activities may be combined to form one workshop. In our experience, we usually had two activities and a presentation for each half-day workshop. Generally, workshops at the top of the graphic were completed first and those at the bottom of the map came later in the process, it is recommended that you choose the activities that make sense for your project and organization. Effective and extensive community outreach and organizing drives successful community participation. Most importantly, having strong outreach and organizing capacity will ensure a deep and rich process whether through your organization’s own expertise or by partnering with experienced organizations to create an outreach plan. Whether or not you have a strong membership base, door knocking in the immediate vicinity can bring additional voices into the planning process and make the entire neighborhood feel included. Face-to-face contact is an important way to engage residents in discussions of why your project is important and to start to develop a community-driven analysis of your current work around TOD issues. The stakeholder engagement process can take weeks to months of organizational time, so it is important to plan ahead for this phase of the project. We customized our stakeholder engagement approach to better engage both community members, institutional stakeholders, and local businesses. Depending on the scope and size of your project, assemble a team of residents and members to knock on doors within a quarter-mile or half-mile of your site. To prepare the door knocking team, host a training session to familiarize everyone with the history of the project and any other background information (see ‘0A Door Knocking Training Facilitator Guide’ in the Appendix). Decide how you want to engage neighbors; designing and administering a survey can be an effective way to introduce them to the types of issues your organization works to address and to invite them to your planning process (see “0C Survey Tool’ in the Appendix). Through door knocking, gather each interested neighbor’s contact information so that you can reach out to them in the future, bring flyers for your event, and provide information about your organization. If residents are not home, leave information about your workshop and organization at the door. You should keep track of people you did not have to face-to-face contact with, and return to speak to them. 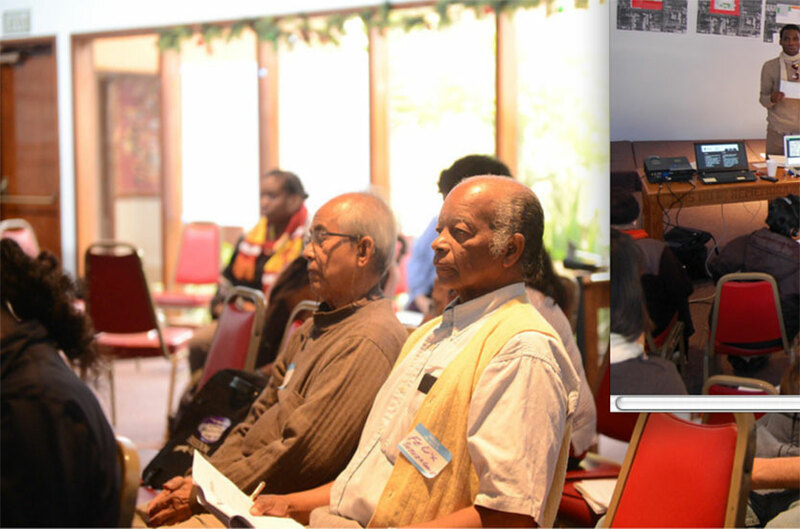 Once you have made initial contact with neighbors, follow up by phone to remind them of upcoming workshops and to connect with them regarding their experiences in and their vision for the neighborhood. An additional strategy to further engage residents is to schedule home visits with neighbors who have been active in the planning process. If the property has current tenants, it is crucial that you engage as many as possible in the planning process. Developing strong relationships and gaining the trust of current tenants is especially important if you plan to redevelop the property, in which case residents may experience temporary or permanent relocation. One-on-one meetings with tenants outside of formal workshops are essential. Host meetings in the subject building so that residents can express their concerns and desires for the redevelopment of the property. Tenants can also be persuasive advocates for the plan and will have unique insight into the neighborhood. Develop materials that explain the need for the project and adapt those materials as your plans advance. Invite stakeholder input early in the process. Prepare a letter of support so that stakeholders can edit and submit to zoning administration and public decision makers. Mapping is a critical tool to understand the neighborhood context of a future development. Questions arise, such as: where do participants travel to in the neighborhood? How do they get there (looking both at routes and modes of transportation)? What obstacles do participants face? For this mapping activity, break out into small groups and, on large maps showing a 1-mile radius of the site, ask participants to mark the assets in the community (schools, grocery store, shopping districts, churches, parks, etc.). Based on where they go in their neighborhood. Then, participants will discuss and mark on the map what routes and what mode of transportation they take to get to these places. Finally, participants will identify places on the map that are unsafe and describe why: cars drive too quickly, danger from violence or assault, trash, broken sidewalks, no shoulder for cyclists, etc. Develop a framework for assessing mobility around the site. Do participants take the bus, the train, walk, bike, or drive? Determine the best ways to get to and from the site. Develop an increased awareness and vocabulary about mobility issues. The maps and notes developed in the small groups help determine physical access to the site. If you have an opportunity to impact street improvements or bike and pedestrian infrastructure around the development, use the mapping exercise to identify and prioritize these improvements. IN ACTION... We used the Safety, Mapping, & Route Planning activity in our very first workshop as a way to have a broad conversation about the neighborhood. The results were instructive. We intentionally defined mobility broadly as ‘how we get around.’ This definition propelled us into a discussion of how to decrease dependence on automobiles and how the substandard infrastructure in our neighborhood does not support people who use alternative modes of transportation. The segue from the definition of mobility to the more complex conversation about the lack of pedestrian and cycle infrastructure could have been more useful if we spent more time with residents explaining our definition of mobility. Transit Oriented Development is a complex and relatively new theme in planning and development. It is important to explore the definition of TOD with participants, especially as it relates to them as residents and transit-users. Through a presentation, define Transit Oriented Development as housing and commercial uses located near a rail station or bus corridors, near services and retail, and near jobs. Adapt and use slide from ‘3A Introduction to TOD’ in the Appendix. Develop a shared vocabulary and definition of Transit Oriented Development. Understand the political landscape in terms of Los Angeles’ recent focus on transit. Lays a foundation for TOD conversations for the entire planning process. Initiates a conversation about increased density and the types of commercial activities on-site. IN ACTION... We presented the Introduction to TOD slides in our first workshop to introduce the concept of Transit Oriented Development and its relevance in our neighborhood. It was important to present this definition early on and to repeat the language throughout the sessions to give participants an opportunity to ground the definition in the neighborhood. In an effort to make our definition of TOD more clear, we developed activities that the larger group would act out, making the meaning more relevant and applicable for participants as we moved along in the planning process. 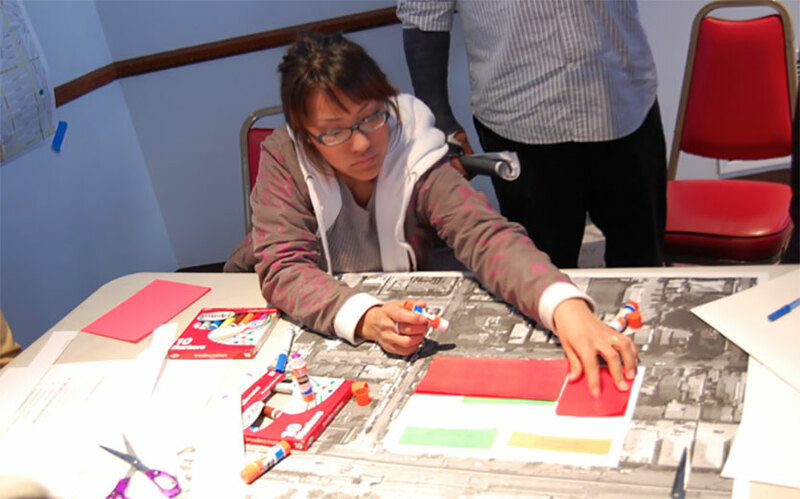 Without context and examples, creating a site plan can be challenging and overwhelming for participants and facilitators. To resolve this, take participants on a site tour of other TOD mixed-use developments. Set goals and plan in advance for the transportation needs as conducting site visits is an integral part of this visioning process that people use as a point of reference in other stages of the process. Visit up to three different comparable sites. At each site, ask a representative from the architecture or development team to lead participants around on a tour of the facility. Center most of the tour on questions from participants at each site and in transit, and debrief together after the tour. Visits to other developments will show us possibilities for site amenities and design features we could include in our development. Become familiar with development and architectural terminology. Participants from this workshop develop ownership over the entire planning process. Gives participants ideas for site planning and layout for the development. Serves as a reference point throughout the site planning process. IN ACTION... The site tour was an effective activity to increase participant commitment to the process and to enhance discussions about architectural design and programming. Though participation was limited by the number of vans we had access to, the depth and complexity of the conversations and shared experience of the tour positively impacted the entire planning process. Participants presented their site tour experiences in the sessions that followed, which helped everybody (even those not on the tour) develop reference points for architectural and site design moving forward. For example, when we had conversations about the open space at Rolland Curtis Gardens, participants who were on the tour shared open-space elements from the buildings we visited. Participating in the tours gave everyone a sense of ownership over the process. Architectural drawings (called ‘Massing’) in their early stages can be non-descript and unappealing since they depict the shape of the structure and not the architectural features. Present printed images of architecturally diverse developments and ask participants to vote for their favorite. This short and effective activity gives workshop participants an opportunity to visually explore the range of possible architectural styles. Learn new vocabulary around architectural styles. Choose a general architectural style to use for the development. Come to a consensus on the general type of architectural style participants wanted for the development. We felt that just showing massing studies represented by big blocks made the development look more like a square fortress and less like a beautiful mixed-use housing development. Without a defined architectural style, the could turn participants off to the entire process. We wanted participants to identify an appropriate architectural style for the building. This was possible because the site tour gave us reference points for different types of styles as well as understanding general layout, uses, and interaction with the street and transit. The architects presented several building styles and participants voted for their favorite. This was a relatively low-intensity activity, from which the architects received significant direction. Our architectural style photos showcased zoomed-out photos of several different developments, but having close-up photos of the actual elements (like roof type, windows, entrances, trim, shape, finishes, etc.) would have led to a stronger discussion of style. In our experience, participants focused attention on the layout of the development’s open space in particular, which should be addressed in site planning activities, instead of the architectural style. Feasibility analysis should be both an internal planning tool as well as an activity with participants. Our internal feasibility analysis began before the workshops in order to define the budget, legal, zoning and construction constraints on the property such as density, height, and parking restrictions, which will limit the ultimate design of the development. In order to determine the initial feasibility, we met with an external feasibility consultant but you can also consult with the Department of City Planning through the planning counter, a surveyor, or you may have the capacity to do the feasibility analysis internally. We were highly conscientious to refrain from defining any more than the most essential and unavoidable constraints before the process started so that participant-driven discoveries and decision-making could be maximized. In between community planning sessions, additional feasibility analysis occurred throughout the planning process sessions. We also incorporated feasibility analysis into an activity that both demonstrated the progress that participants had made in developing the site plan and gave participants an opportunity to prioritize their own proposals for the development. Throughout the workshops, participants will develop a significant number of proposals and suggestions for the site. After several sessions, develop a matrix that begins to track all of the participant’s ideas that were generated through the workshop and group activities. Categorize the ideas into groups, e.g. service, commercial, design quality, community areas, building features, and commercial space. Note the workshop from which the idea was generated. Increase transparency of planning process, holding facilitators accountable to a truly participatory process. Once charted and categorized, participants can prioritize all information generated in the workshops in a following session. IN ACTION... After our first workshop, we designed a matrix to identify and chart every proposal and suggestion that was made throughout the planning process. This internal matrix helped us in our feasibility analysis and also served as documentation of the outcomes from each small-group activity. We turned this internal document into a group prioritization activity where participants were able to rank the ideas that had been generated along the process. (See ‘Prioritizing and Evaluating Participant Proposals’ activity, below). Once you have developed the matrix of every proposal and suggestion, you will need to prioritize each suggestion with the participants. This prioritization activity will democratize the feasibility conversation that will follow. For the activity, break out into groups of six to ten participants. Each group will receive items from a single category in the matrix developed by facilitators in between sessions (see ‘Documenting Participant Proposals: Planning Activity,’ above). Participants will prioritize the items by voting with stickers. Items from each category will be split into three levels of feasibility: Possible, Challenging, and Impossible. If a Challenging or Impossible ‘item’ is prioritized over other ‘items’ discuss why the items were not possible and their tradeoffs. Review all of the suggestions and input that have been added thus far. Prioritize different elements of the site plan based on feasibility. Together, prioritize all feedback from previous workshops and activities. Since participants will generate a lot of feedback and ideas through the planning process—some of which are not feasible, some of which are not complementary—this activity will eliminate some suggestions and prioritize others. IN ACTION... We received a lot of positive participant feedback for this workshop activity. We all enjoyed seeing our progress and how participation in previous sessions had driven the design of the final development plans. Participants led the conversation about feasibility, tradeoffs, and prioritization, which happened naturally during the exercise and with relatively little conflict between attendees. This activity provided us with the opportunity to discuss and eliminate some suggestions such as the tradeoffs of developing a swimming pool or having open play space. Other elements were more complex, like childcare. Due to zoning and open space restrictions, we could not house a childcare facility in the commercial component of the development. The process of the small group activity was highly democratic and led to an outcome that all participants were happy with and proud of. Parking is often a contentious issue (especially in Los Angeles), but it is important for participants to understand how parking and driving negatively effects the health of our communities, degrades the environment through pollution, and drains our financial resources due to the expense of owning and maintaining a car. Through a conversation with participants, present and discuss the tradeoffs of parking. Participants and stakeholders may push back if the proposed development has reduced parking. Learn the true cost of owning a car - How much does it cost to own a car? How much it costs to build a parking space? and the environmental, health, and community impacts of car ownership. Review alternative forms of transportation in the context of our development. Explore and challenge the value that our society places on car ownership. Learn about the impacts of car ownership on our community, the challenges of a parking space for each residential unit. Participants will become advocates for reduced parking based on the impacts of car ownership on the community and environment as well as the cost of developing parking spaces. T.R.U.S.T. South LA’s primary motivation in seeking reduced parking for Rolland Curtis Gardens is driven by our guiding principles of protecting and minimizing our impact on the environment and improving the health of our community. As a secondary motivation, we faced spatial and monetary restrictions on building out the full number of parking spaces required. We expected to have a lot of pushback at this meeting, but instead participants were supportive of and invested in decreasing the number of parking spaces available to residents. Additionally, participants committed to using alternative forms of transit (which we had not planned). The workshop served as an introduction to terms like “car share” and “bike share”, and participants became strong advocates for parking reductions at subsequent workshops. Developing a comprehensive and visionary site design with participants demanded creative design activities. Architecture and development are not traditionally fields that are highly accessible to those not working in the field since it has specific industry jargon and requires a strong understanding of geometry. The following activities and presentations help to break down barriers to site planning. 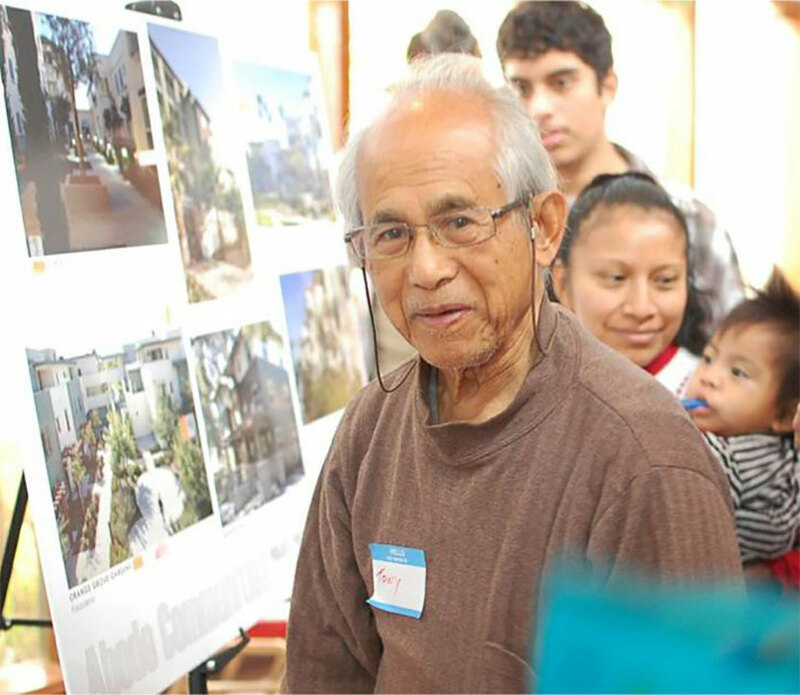 By starting from scratch, participants and facilitators can rely on their respective expertise to design a development that reflects the desires of neighborhood residents and that suits the neighborhood context. We typically had at Planning Action Item Planning Action Item least one site-planning!activity in each of our workshops. 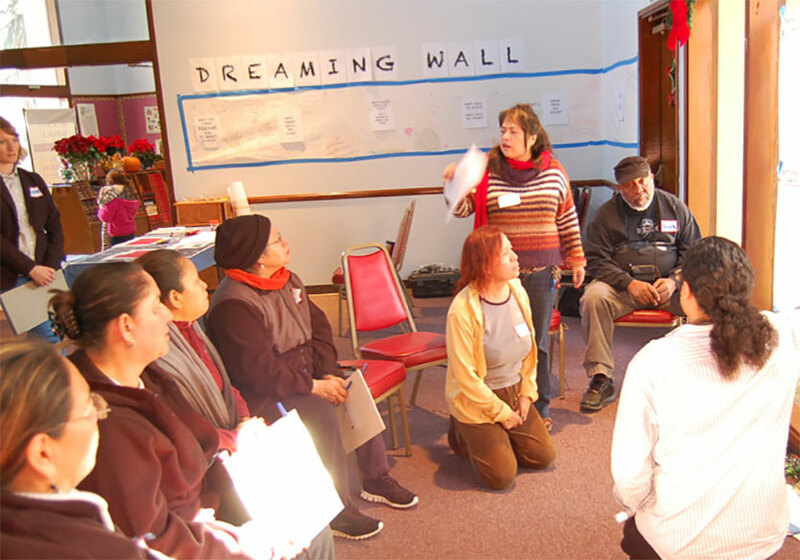 In this activity, participants will break out into small groups to plan their ideal development. Each group will have a birds-eye view map of the neighborhood with the site or the development in white, a blank slate to plan. Cutouts in different colors represent various uses: parking, residential, open space, and commercial. Each cutout and shapes corresponded to a certain square footage, which is to scale for the site. Participants will cut up the shapes and will have to use all of the pieces. They may layer different uses on top of each other. Make preliminary designs for the future development. Our designs will show where people will live, where we will have open space, where people will park, where the commercial space will be, etc. This puzzle-like activity will create the initial design for the development. Creativity and imagination of participants drives the design of the development. Participants were very creative in their placement and description of development elements. Final products from this activity guided the initial designs for the new development and began the discussion on how to prioritize and incorporate the list of features and site plan elements for the development, which were identified in the Matrix. Through this activity we were successful in conveying that we had a blank slate to work with and that this was going to be a development generated through community participation. The facilitators came to the table knowing the total allowable height, buildable ground floor area, maximum number of units, and parking requirements. Through our internal evaluation of this activity every member of the facilitation team stated that the outcome from this activity (and therefore the final product) resulted differently than we had initially expected and different from the norm of mixed-use affordable housing development (which would have apartments located directly above retail uses instead of set back). Additionally, as a result of this activity we collectively decided that the commercial parking lot (situated between the residential and commercial buildings) should also serve as a programmable space for farmers markets, health fairs, and event and play space for youth in the hours when the commercial tenants are closed for business. Participants know what types of commercial uses- both retail and services- are missing from the neighborhood. 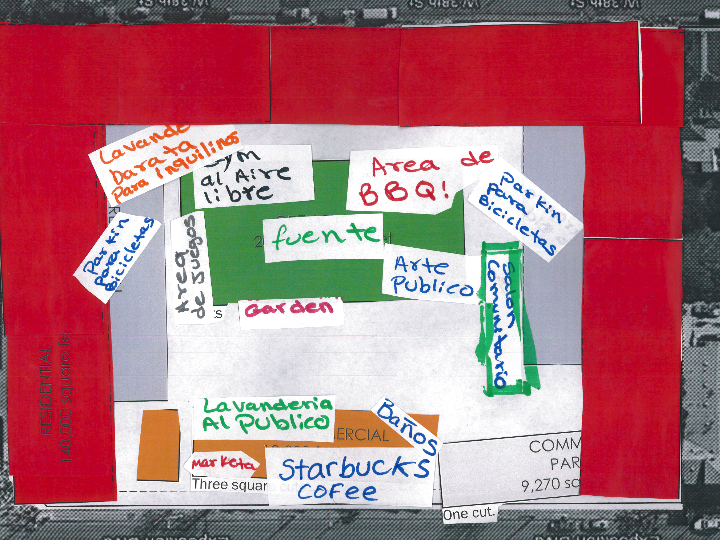 Ask participants to brainstorm different commercial uses for the development: What types of commercial activity would they want to see in their neighborhood? Discuss and consider different types of commercial and retail that we would want in our development. Specifically, what kind of businesses and services do we want in this neighborhood? Come to understand what kind of commercial services the neighborhood is missing. A community approved list of potential uses for the commercial space of the development. Through this brief activity, participants listed all of the types of commercial tenants that they would like to see in the neighborhood. Participants suggested youth services, bike repair, coffee shop, barbershop, healthy food store, health clinic, pharmacy, childcare, and many more. This low-intensity activity yielded quality suggestions for filling the retail, service, and general commercial gap in the community. We used the information gathered through this activity to begin outreach to potential commercial tenants for the finished development and to determine the final square footage of the retail spaces. For the facilitators, commercial meant both retail and services but to some participants commercial meant only retail. Expanding participants’ understanding of the term ‘commercial’ would lead to a stronger discussion of the needs of the broader community. From the results of the cutout activity, produce two different site plans. In small groups, ask participants to review the plans based on their own experiences and also through the Transit Oriented Development framework. Break out into groups of five to eight participants and present the different elements of the plans as well as the TOD framework. Contrast and compare the two printed site plans; draw what you like and dislike directly onto the printed plans. Edit the different types of designs made in the cutout activity. Determine likes and dislikes of the distinct site plans. Participants are able to pick up on similarities and differences between the two designs, combine elements from the two plans, and narrow in on a rough draft of the final site design. Prioritize what features are critical versus those that may be less urgent/necessary. During a brief presentation, the initial designs - one “U” shaped building and another with two “L” shaped buildings - were presented which helped explain how information from previous workshops influenced the site planning process. In small groups, we broke down how the two site plans differed- based on the dynamics of the group. We should have made the presentation of the two in the small groups, but each community should make this decision for themselves. In the small groups, facilitators ‘walked’ participants through the specifics of the plan (repeating the presentation) showing where they would enter the building, where people will park, where kids would be able to play, where the laundry will be, etc. The presentation of two options gave participants the ability to pull out and compare elements that they liked. Together, we decided that we liked the idea of having two L-shaped buildings, but that the shape of and access to the open space of the U-shaped building was preferable. To improve the activity we would develop more inquisitive questions since initially our questions did not elicit strong comments. Instead of asking what participants liked and disliked, ask participants to compare the two plans; or to describe how the plans allow for different kinds of uses, like how kids might play, how older residents might get around or how this plan is safe or unsafe. Green space, safety, and access for people, bicycles, and vehicles are usually top concerns of participants throughout the planning process. Present a single site plan for the development and in small groups assess the green space, safety concerns, and physical access to the building. In small groups, ask critical questions about the development, giving participants an opportunity to analyze and further refine the site plan. Improve the development based on the type, size, and access to green space; safety concerns, and how residents, cyclists, and vehicles will enter the building. Make recommendations to further edit the site plan. Discover how residents want to interact with green space in the development; how the site plan can mitigate and improve residents’ perception of safety; and the best location for entrances for pedestrians and vehicles. The presentation and small group discussions focused heavily on the experience of future tenants: physical safety on the streets directly adjacent to the site; whether it was better for residents to access the site from the busier commercial street or from the quieter residential street; security interventions in the building; how to ensure that the public is well-lit; different types of activities that might take place in the green space, etc. Residents invested a substantial amount of time expressing their desire for increased safety through a community watch model rather than by installing security measures like cameras and gates. For this presentation, prepare the final site plan based on participant input through the entire community-driven planning process. It is a way to show the final designs and to celebrate your accomplishments. In small groups, review the final site plan, asking participants to present all of the different elements. Host a conversation about how participant ownership of the process leads to a final development produced by the community. This small group activity leads directly into the ‘Final Action-Plan’ activity, below. Voice your support and any remaining concerns for the plan. Give participants space to talk about the process and take ownership of and champion the final development. Participants practice supporting and defending the development through their presentations of site plan elements. Engage potential tenants, who will be supporters for the project through the entitlement (seeking of a zone change, etc.) and permitting process. As part of our final workshop and celebration, this small group discussion was a way for us to wrap up our site planning process and turn the conversation toward the development timeline. Since this project will require the approval of several different boards and commissions, we wanted to make sure that a) participants were satisfied and excited about our process and the final development and b) that we were prepared as a group to defend the project through the entire development process. Unexpectedly, this small group activity turned into training for presenting/defending the project. It was successful in wrapping up the planning process. This small group discussion led directly into the ‘Action Planning’ activity, seen in the pages that follow. Over the course of the planning process, participants will develop ownership over both the process and the final development program. 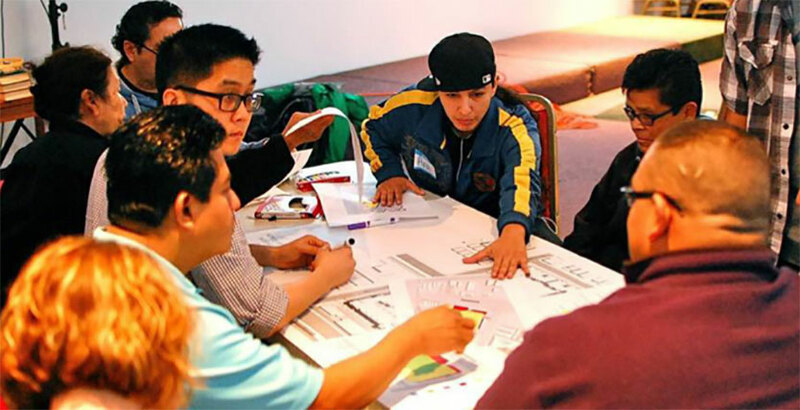 Developing an action plan can strengthen participant ownership beyond the term of the planning process, which builds a strong sense of community between participants and also prepares participants to advocate in support of projects during the permitting process and time construction. Once the final site plan has been presented, prepare participants to support the project and take ownership of the development process. Set up a piece of butcher paper so that participants can ‘sign-on’ to the project with their signature. This is especially important when you face potential opposition from city officials and other stakeholders who did not participate in the process. Additionally, this activity serves as a means to begin an organizing committee with tenants and as a way to continue to build a base for your organization. 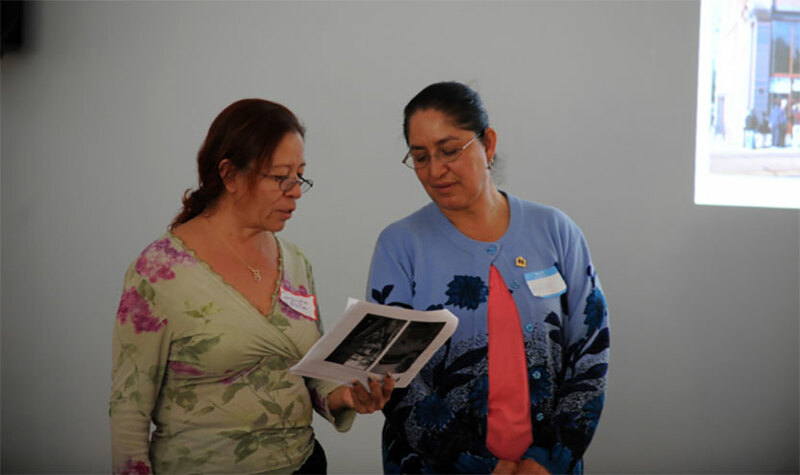 Receive written support from participants for the development. Advance an action plan to support the final site plan through the development timeline and any political or neighborhood hurdles you may encounter. Directly following the discussion of the ‘Final Site Plan’ review activity, we had participants sign-on in support of our site plan for Rolland Curtis Gardens. As participants signed-on, they made a spoken pledge to the development, which was unplanned but highly emotional and powerful. Many of the participants who signed-on to the development plan agreed to meet before the end of the month to create the Neighborhood Organizing Committee that will shepherd the development plans through the City’s permitting and planning process. Our Neighborhood Organizing Committee has already testified in support of the development at several meetings since the completion of the plan. 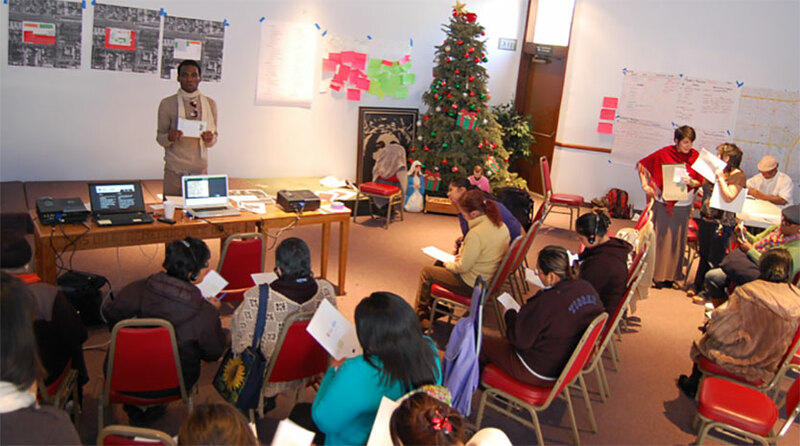 Through the development of our initial goals for participatory planning, we identified evaluation as one of the most important components of our process. We had two different evaluation processes: first, participants evaluated each workshop session that we hosted (see ‘15A: Workshop Evaluation Materials’ in Appendix). Participant evaluation helped us improve the subsequent workshops. Second, directly after the final workshop in March 2013, the facilitation team reconvened to evaluate the entire process: from goal setting to action planning (see ’15 B: Internal Evaluation Materials’ in the Appendix). In our internal evaluation, we reviewed whether we had achieved our initial goals for the process (see ‘Goals and Priorities’ section, above) and whether the process helped us reach a final product: an innovative and viable site plan. By conducting internal evaluations throughout the process, we were able to reflect on what worked and what could have been changed for a more effective outcome. Evaluations of our work can be found in the “In Action” sections at the end of each workshop description. © Copyright 2013-2019 T.R.U.S.T. SOUTH LA. All Rights Reserved. We encourage you to print, use and adapt these materials. Please acknowledge T.R.U.S.T. South LA.